BYE BYE boring old chicken salad HELLO Addictive Curry Chicken salad!!!! Be the envy of the potluck!! I get excited about most curry dishes but this curry chicken salad WHEW, it makes you wanna, well moan! It is addictive and perfect for dinner, lunch, an appetizer or mid-day or late night snack! 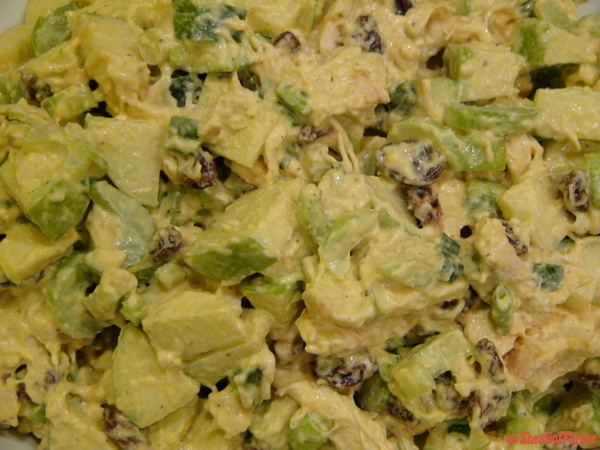 When I made this addictive curry chicken salad for my Hubby, he said “Baby that was the BOMB”! I was inspired to make this addictive chicken salad after tasting something similar from a cafeteria buffet, then I had some with curry in it from a local caterer, so naturally I went home and got to experimenting! After 2 versions, the 3rd time was the charm and honey it was another BAM POW BOOM KABANG kinda moment! I mean really, the flavors in this dish hits you that hard! The sweet tangy from the apples and then the sweetness from the raisins and to top it off the juicy meat from the baked chicken, owe wee, sheer goodness!! 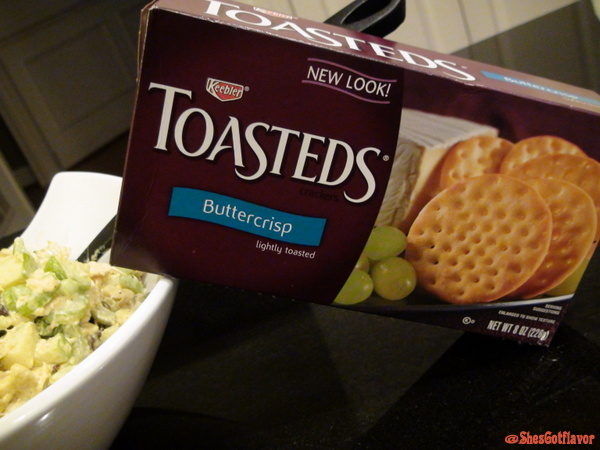 We won’t even get into the Buttercrips Toasteds Crackers by Keebler that partner perfectly with the heavenly flavors – OMG! Hope you enjoy this addictive curry chicken salad as much as my family and I have. Please do not forget to LIKE my FB FAN page on my HOME PAGE and SUBSCRIBE to my blog to receive these fantastic recipes via email. AND let us not forget about TWITTER (click here)! Now where did you think I was going without giving you an up close and personal view? Queen Utokia! And yes!!! Queen! Because this recipe was nothing but ROYAL!!!! OMG!!! Every bite of this chicken salad was a burst of yummy goodness! I made a bowl of this and lets just say my boyfriend and I ate the entire bowl!!! He doesn’t even like chicken salad!!! 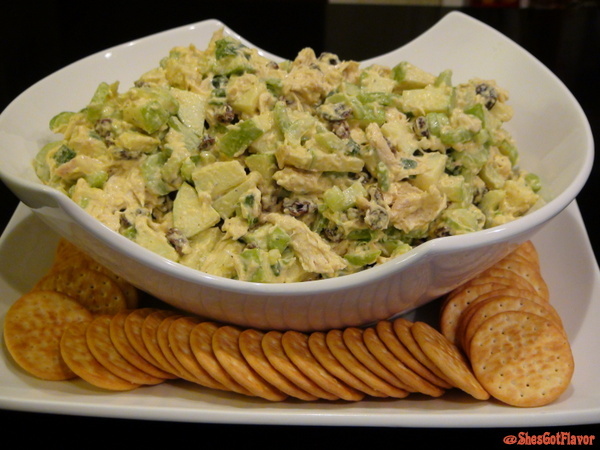 I woke up thinking about this chicken salad which I think I am going to make today again! My stomach is growling just thinking of it. U are the bomb!!!! I Love u! You are truly a lifesaver for those who just started cooking.. This looks so similar to a bacon salad i had early this year. i have since been looking for the receipe. instead of chicken shredded bacon was used, i could also taste some mint leaves and maybe cilantro, but no celery. what do you think? I made this for dinner tonight and was fantastic. I know I will be serving this up for the girlfriends when they come for lunch at my place. Delish!